It seems an unlikely sort of handbook to emerge from work being done at The Cooper Union. But Thinking on the Page: A College Student's Guide to Effective Writing (Writer's Digest Books), released in March, stands out in a field of writing handbooks precisely because of its origins at an institution focused primarily on art, architecture and engineering. 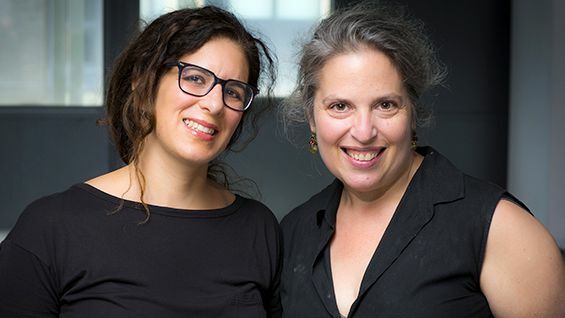 Gwen Hyman, director of the Center for Writing and adjunct assistant professor in the Faculty of Humanities and Social Sciences, co-authored the book with her colleague Martha Schulman, a writing associate and adjunct instructor in HSS, based on their experiences working with students whose talents and training do not typically get expressed in written form. "We found that there was really no guidebook to college-level composition out there that was useful for visual or computational learners," Professor Hyman says. "We both have focused on developing methods and approaches for writing that work for Cooper students. Cooper kids are more brilliant and interesting and amazing than anybody else but they share with most college students an approach to writing that is not the way English majors think. And so we wanted to get that out into the world." The book came out of the co-author's work in the Center for Writing and the classroom, but the process of figuring out how to take these more improvisational interactions and codify them took about five years. "The book is about empowering students," Professor Hyman says. "That's a squishy word I don't use very much but it's really what we are doing. And in thinking about how to do that in this form what we found was that we couldn't take what we've done and just transfer it to book form. We had to come up with a new way of thinking about our process that synthesizes what we've done and brings together the ways we approach it but also is something different." "This is not a grammar handbook," Professor Schulman says. "There weren't any books we felt that really set out to say: Here is what an essay is and here is why you want to write one, as opposed it to just being your obligatory work. We want to talk about process and the way it gets you to product." Just a quick flip-through of Thinking on the Page reveals some of its distinguishing characteristics. It uses illustrations, by Olive Panter A'14 and a former student of the co-authors, to put across some of its points about structure and to demonstrate techniques. Hand-lettered "mind maps" and doodled storyboards give the sense of how a more visually oriented student might begin to work out a plan for a written essay. The room that houses the Center for Writing, where the authors sat down for a chat, has been designed to foster precisely this kind of approach. "We want to take students away from the computer screen and really have them break writing out in different ways." Professor Hyman says. "There are whiteboards all over this room because we ask students all the time to create charts and sketch things out. The architects for the room originally imaged cubicles for this space. We wanted it open even though it can be loud and hard to concentrate. We want that sense that this is not shameful work. This is open. This is collaborative." What began over 20 years ago as a voluntary peer-tutoring program quickly evolved into a critical, constantly in-demand resource. When Gwen Hyman became director of the Center for Writing in 2002 she professionalized it by hiring a staff of writing instructors. 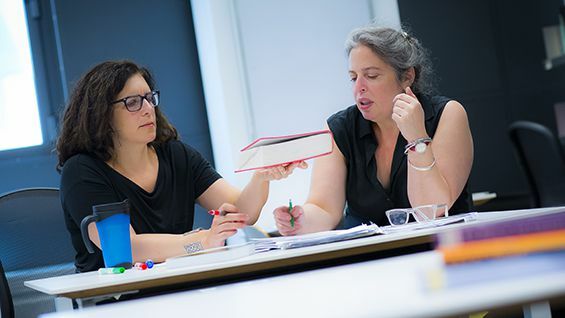 “We try so hard to make sure that every student works with a writing associate who's a good match for them,” Professor Hyman says. “All the writing associates are gifted, dedicated teachers of writing, but each writing associate has their own style, and each person brings their own approach.” Students now use a website to book individual sessions or those that occur on a weekly schedule. Where once the staff may have had occasional down time, now there are waiting lists for available sessions. If someone doesn’t show up for a session after ten minutes another one will get a text message and come rushing in, anxious to work on an assignment. The Center for Writing has attracted some donors who see its unique value. Several years ago David Levy CE'74 worked with the Office of Development to establish an endowed prize for writing that honors the memory of humanities professor Frank Caldiero. The fund grew so that this year it became possible to also establish a named position at the Center for Writing, the Caldiero Writing Fellow. "As the Internet continues to expand, and with it the age of instant communication, the skills taught at the Writing Center will only grow in importance and impact," David Levy says. Similarly, the family of John Alpert ME'41 support a John Alpert Writing Fellowship position run out of the Center. 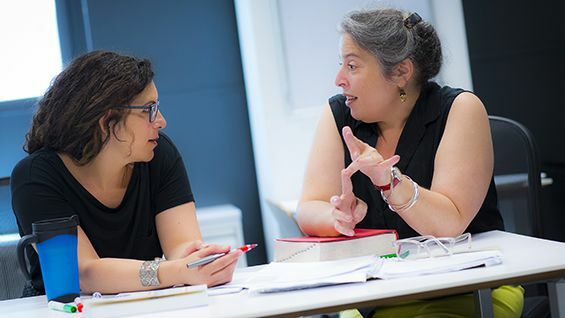 The Alpert Fellow works directly in the classroom with faculty and students of the Albert Nerken School of Engineering to focus on writing skills. "My father, the child of struggling immigrants, was an excellent writer who believed his English language skills were essential to his success," Jane Alpert says. "He wanted Cooper Union, the school he loved, to do more to help engineering students become effective writers." Students use the Center for more than just focusing on particular papers. They also seek assistance in articulating their artistic, architectural and engineering projects. Amanda Machnik A'15, winner of a Fulbright grant in her senior year, credits the Center for Writing for helping her work out her ideas. "I found that the one-on-one sessions in the Writing Center really challenged me to ask myself what work I was making and why," she said. The value of critical thinking and hard work cuts across all disciplines at The Cooper Union, deeply informing Thinking on the Page. "One of the things I think is useful about this book is that we acknowledge that writing is difficult," Professor Schulman says. "A lot of students think, 'If writing is hard it's because I'm doing it wrong.' We are actually saying that if it comes easy it's because you are doing it wrong. You are not thinking. And in this way it applies to every field. How do you make a new piece of art? Well you start by asking a question. How do you advance science? You ask a question. How do you invent something? You ask a question. So it's the mode of inquiry in everything you are going to do."